Hook: Capra opens with a successful framing device that hooks the reader with a sneak peek of the climax. The movie opens at the height of the main character’s troubles and immediately has us wondering why George Bailey is in such a fix that the whole town is praying for him. Next thing we know, we’re staring at an unlikely trio of angels, manifested as blinking constellations. The presentation not only fascinates us with its unexpectedness, it also succinctly expresses the coming conflict and stakes and engages the reader with a number of specific need-to-know questions. First Act: The first quarter of this classic movie is entirely, blatantly, and beautifully about character development. Under the guise of explaining George Bailey to novice angel Clarence, the head honcho angels show us all the prominent moments in George Bailey’s young life. We see him as a child, saving his little brother’s life, losing the hearing in one ear, and preventing old Mr. Gower from accidentally poisoning a customer. We get a glimpse of him as a young man, planning his escape from “crummy” Bedford Falls, even as he begins to fall for the lovely Mary Hatch. By the time the inciting event strikes, we know George Bailey inside out. We’ve been introduced to Bedford Falls and its colorful array of denizens. And we’ve learned of the stakes from the mouth of George’s father, who explains the importance of the Bailey Building & Loan in giving the people a haven from evil Old Man Potter. 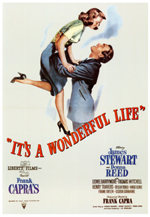 First Plot Point: Throughout the first quarter of the story, George Bailey’s plans for his life have progressed uninterrupted. Despite his various misadventures in Bedford Falls, he’s on the fast track to a European vacation and a college education. Then the first plot point hits, and his life is forever changed. When his father dies of a stroke, George’s plans are dashed. As in Pride & Prejudice, the standards that have already been established in the story are dramatically altered. This is no longer a story about a carefree young man freewheeling around town. From here on out, this is a story about a man forced to take responsibility by working at the Bailey Brothers’ Building & Loan. Inciting Event: This classic movie uses the entirety of its first act to leisurely introduce and build its characters. Its inciting event doesn’t occur until the first major plot point when George’s father dies of a stroke. This is the moment that forever changes George’s life and sets the subsequent plot points in motion. Key Event: But until George made the decision to take his father’s place as Executive Secretary of the Bailey Brothers’ Building and Loan, he could have walked away at any point. His decision to stay in Bedford Falls constitutes the key event because it officially engages him in the plot. First Half of the Second Act: George’s life could have progressed exactly as he wanted it to, even after the inciting event in which his father dies of a stroke. But when he reacts to Mr. Potter’s attempts to close down the Building & Loan by agreeing to stay in Bedford Falls and take his father’s place, his life is forever changed. For the next quarter of the movie, we find George adjusting to life in Bedford Falls. When his brother Harry (who was supposed to take George’s place in the Building & Loan) gets married and takes another job, George is again forced to react. He marries, saves the Building & Loan during the Great Crash, and opens up Bailey Park—all reactions that build upon his initial decision to protect the Building & Loan. Midpoint: George Bailey’s period of reaction ends when Mr. Potter summons him to his office and offers him a job. This entirely unexpected and unprecedented move on the antagonist’s part sends George’s head spinning with the possibilities. Suddenly, the life he’s always dreamed of is within his grasp. He’s within seconds of accepting the offer, when he comes to a realization that changes his life just as surely as Mr. Potter’s job offer would have. This is the moment when he stops reacting to his fate in Bedford Falls and deliberately (if still unhappily) embraces it. When George leaves Potter’s office, he’s the one in control of his life for the first time in the story. Second Half of the Second Act: After spurning Old Man Potter’s attempts to buy him off, George comes to grips with his life in Bedford Falls and moves forward. He and Mary have four children, and he remains home during World War II (“4F on account of his ear”) and continues to protect his town from Potter’s avarice and manipulation. Thanks to his renewed commitment to the Bailey Building & Loan, in the aftermath of Potter’s failed attempts to corrupt him, George is able to put his life into pretty good order during this second half of the story. Of course, viewers already know this is only the calm before the storm of the climax. Third Act: The third act is made up almost entirely of Clarence’s action and George’s reactions. The antagonist isn’t even present in the unborn sequence that fills up most of the third act (although his presence looms large). The focus here is entirely on George’s inner journey and transformation. Climax: In the moment after George’s “gift” of seeing the world without himself in it, he runs back to the bridge and fervently prays, “I want to live again!” This moment is both his personal revelation and a bit of a faux climax. It properly caps the unborn sequence (which follows a mini plot and structure of its own) and leads to the true climax in which the town rallies to help George make up the lost $8,000 before he can be arrested. Resolution: The closing scene of this classic movie has viewers crying all over the place every Christmas. It wastes no time in moving on from the climax, in which George’s friends bring him above and beyond the $8,000 he needs to replace what was stolen by Mr. Potter. In fact, in this movie, the climax and the resolution are the same scene. The resolution ties off all remaining loose ends by bringing the entire cast (sans the antagonist) back for one last round of “Auld Lang Syne” and by hinting that angel Clarence has finally gotten his wings. This is a tour de force of an emotionally resonant closing scene that leaves readers wanting more while still fulfilling their every desire for the characters.